Chronicling Elizabethtown: Elizabethtown says, "Walk this way!" A few months ago, some borough staff members saw a presentation of a walkability audit of another Lancaster County community. Upon asking about it, they soon had an offer to do a walkability audit here in Elizabethtown. It's scheduled for 1:30 to 3:30 p.m. on Friday, March 28. Participants -- and anyone in the community is invited to participate -- are meeting in the Free Parking Lot on Cherry Alley behind Groff's Meats. 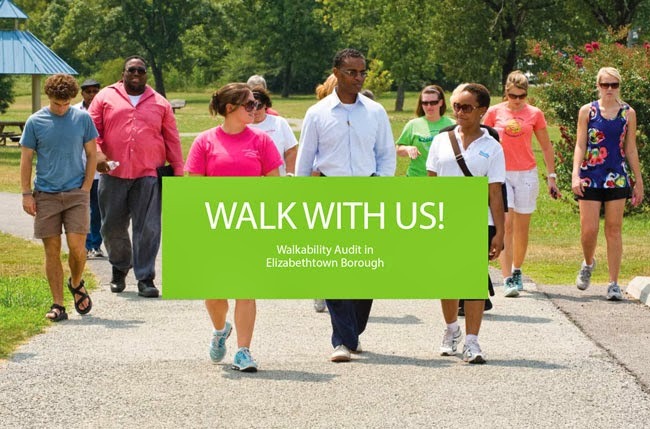 An email invitation to attend the walk says the audit will focus on assessing how friendly parts of Elizabethtown are for physical activity and healthy living with the ultimate goal of providing education, inspiration and practical planning tools. I wanted to find out a little more about what that means and what a walkability audit is. So I got in touch with Ben Craddock, an engineer with C.S. Davidson, who will be doing the audit. First things first, Ben said: "It would be great to get some residents to partcipate…sometimes they’ll pick up on things that we 'experts' overlook." I read that to mean, "If you have the time and interest, tag along on this and let your voice be heard." With that, let's find out more about the audit. Jeff McCloud: What is a walkablity audit? Why do a walkability audit? Even though we’re just sampling a small portion of the community, participating in a walk audit gives the participants first-hand knowledge of what features make a community walkable or not. Many of us think we have a decent idea of how walkable our community is…until we actually try to walk somewhere. Or we try to get there with four kids in tow. Or we try to do it with piles of snow in our way. A walk audit gives us a much different experience than you would get from driving on the exact same streets every day. What will we in Elizabethtown get from the audit? First, it will raise awareness of just how important walkability is to your residents and the community. Some folks will already be very aware, but sharing the experience with your neighbors helps to get people on the same page. It can actually be a fun community building event. Second, you’ll get a report with a summary of the ratings and some recommendations for improving the walkability of that route. Recommendations often will range from short term easy fixes to long range planning solutions. Hopefully the recommendations generate ideas for improving other walking routes within the Borough as well. We’ll also try to identify some resources for the Borough for funding improvements and for providing ongoing education, assistance, and support. What would you say to someone who says, "A walkability audit? Why? I can walk anywhere in town just fine." If someone asked me that question, I’d say, “Well then come on out and share your insights with those who might not walk as much as you! You might be just the expert that we need to help us understand how important walkability is to you and your community.” It is quite possible that the audit will show that your community is very walkable and that you just need to keep up the great work. It’s sometimes nice to hear that you’re doing a great job and have reason to celebrate. Will the audit look at existing infrastructure or things like the planned walking pathways? We’ll be nailing down the exact walking route (borough staff) soon (this week, I think.). We typically look at existing infrastructure since we’re trying to see how walkable the community is in its current state. But the Elizabethtown's future plans will certainly factor into the type of recommendations we make. For example, we probably wouldn’t recommend major upgrades to a poor walking route if we know that a new path will connect people to the same destinations as that poor route. As a frequent runner, I am curious to see the results of the audit. Based on my experiences, I'd offer this feedback: There are a few sidewalks that are barely wide enough for two people. Some are on busy streets, and find myself forced into the street to pass someone. If you can participate in the audit, please contact the borough office at 717-367-1700.